S. D. College of Engineering & Technology believes that the entire placement exercise is an outcome of collaborative effort between the institution and the industry. It is very significant for the students to be properly counseled and guided for their career options. 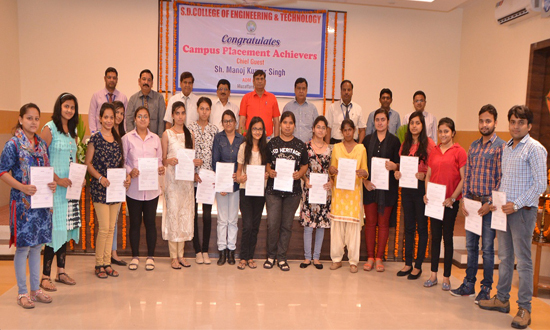 The training and placement department of S. D. College of Engineering & Technology is self-sustaining and focused, working incessantly to help the students in getting their dream jobs. For making them employable, adequate training provided to the pre final and final year students. The institute has regular trainer for PDP and to Sharpen their skill we invite experts from industry and other agencies.